Today, more and more women are successfully opening businesses in the Russian economy simply because they are interested in becoming entrepreneurs. The Eurasian Womens Forum will be held on 1921 September in St. Petersburg. In the meantime, we decided to investigate the progress women have achieved in business on the basis of several success stories. In 2013, a year before the story of the 3D printer that shook the floors in her mothers apartment, Marina got into a conversation with a friend at a meeting of classmates. He wanted to straighten his teeth, and the doctor advised that he use aligners, which are transparent devices made of a special orthodontic plastic that is more comfortable and inconspicuous than braces. The American company Align Technology produced the aligners in Mexico using 3D printing technology. Customers had to wait three months, and the product cost about EUR 5,000. As Marina recalls: «A classmate asked me why no one in Russia made these aligners. I told him that I was no dentist, and that the only 3D Id seen was at the cinema.» But after that, Marina took a greater interest in the issue, and she began to read a lot about 3D printers and scanners. She studied programs for modelling dental alignment, and she conducted an independent study of the market. She dropped in at clinics and asked: «Hello, Im doing market research. Can I speak to your orthodontist?» Generally speaking, the clinics helped her out. She discovered that the leading Moscow specialists were also interested in these dental aligners, but it was a very expensive service. Eighteen months later, Marinas company was posting nothing but losses. The aligners could not be sold until they were certified by the Federal Service for Surveillance in Healthcare (Roszdravnadzor). In order to gain certification, she would have to pay for a medical expert and dental technician and purchase more consumables. It was only after the company received certification that it was able to post revenue of RUB 700,000 in 2014. And then the crisis struck. The cost of foreign consumables doubled. «2014 and 2015 were horrific. I went personally to dental clinics to try to tell the dentists about my company. In nine cases out of ten they didnt let me past the reception desk.» However, slowly but surely the client base grew and in 2015, the company made it out of the red. According to Marina: «It became easier after that. In 2017, we developed software that creates 3D anatomical models for computed tomography.» Thanks to this software, 3D Smile is already entering foreign markets, including the US, India, China, and the EU. Just four years after the launch of the company, 3D Smile became the largest producer of dental aligners in Eastern Europe, producing 8,000 products per month. 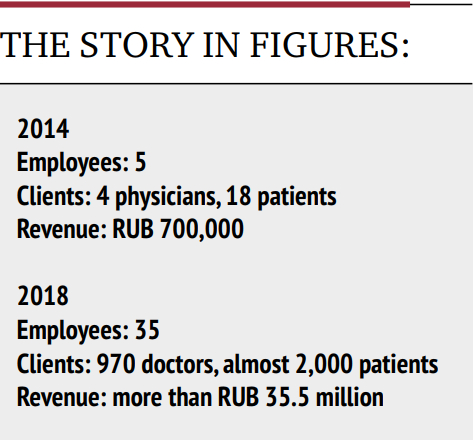 For patients, the average cost of the service is RUB 200,000250,000. Thanks to the companys entry into international markets, Marina hopes to achieve revenue of USD 100 million by 2021. In 2016 the company became a Skolkovo resident. Now, 3D Smile has 35 full-time employees and its own laboratory, which prints the aligners using seven printers. Here, the floors no longer shake. And there is no reason to fear that the neighbours will complain.